Jake Odorizzi was cruising right along and then BAM, he couldn't find the strike zone. With one out in the sixth, Odorizzi issued consecutive four-pitch walks and was removed. Cleveland jumped all over Alan Busenitz to turn that into a decisive four-run inning. Odorizzi’s third time through the order issues are well documented. He got off to a great start the third time through, striking out Francisco Lindor to end the fifth. He also got Michael Brantley to pop out to open the sixth. Then came the consecutive four-pitch walks and the hook, but Odorizzi still exited this game with the Twins up 2-1. 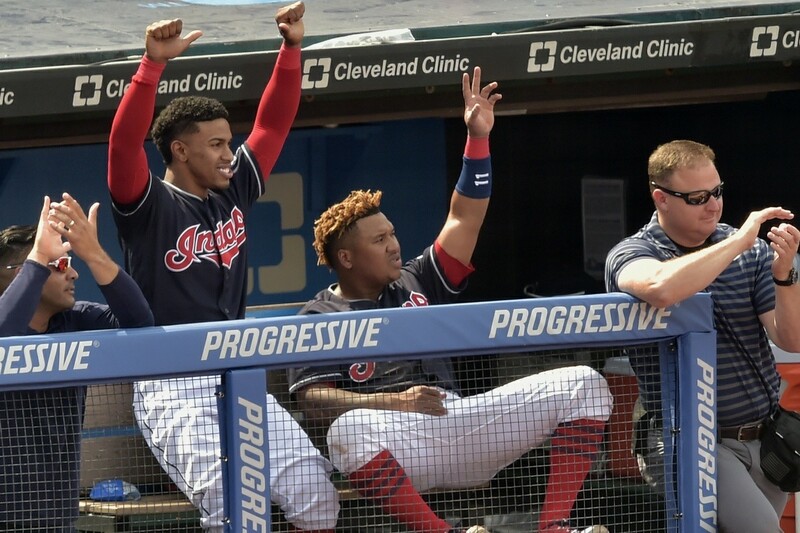 Busenitz came in and gave up a game-tying single to Yonder Alonso and then a three-day homer to Jason Kipnis. 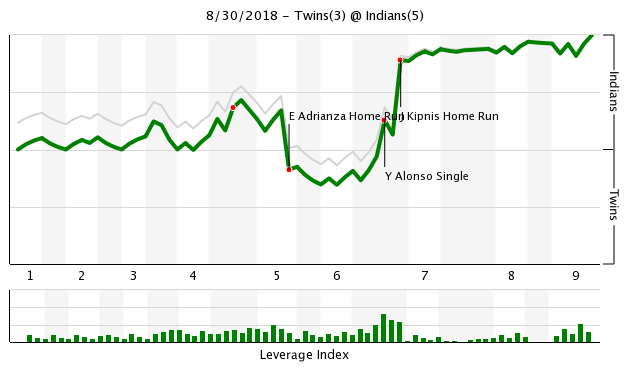 All the Twins’ runs came via the longball, as Ehire Adrianza hit a two-run homer in the fifth inning and Miguel Sano hit a solo shot in the ninth. Jorge Polanco's sat for the third straight game and Eddie Rosario left this one in the sixth inning due to a leg injury. This game was broadcast on Facebook, and their booth crew, including Glen Perkins, asked Paul Molitor during an in-game interview about future roster plans. He said a decision on Byron Buxton would be coming sometime in the next 24 hours and some of the specific names he mentioned among September callups were Tyler Duffey, John Curtiss and Zack Littell. CLE 8, MIN 1: Where Did the Runs Go? Why is Busenitz having such a difficult time adjusting to MLB?I have no answer - just a question. I still say Odorizzi is a perfect multi-inning BP pitcher.Just do not let batters see him three times. Some TD posters do not like my take on Kepler, but 227 is not an acceptable BA for him.If he has a positive WAR it raises my skepticism about that stat.Kepler is not meeting anyone's projection - what next? Now the challenge for the Twins is to not lose 90 games.Good luck. Busenitz just isn't fooling anybody right now. I think he's used to Triple-A hitters chasing his curveball and that's just not happening much when he's at the MLB level. It's a good pitch, but he can't just bury it in the dirt and expect guys to go chasing it very often. On Kepler, coming into today he had the sixth-lowest BABIP among the 152 qualified hitters at .241. Some of that he can control -- he needs to hit fewer popups, for example -- but some of that is bad luck. As far as his high WAR, depending on where you're looking a lot of that is built off his excellent defense. FanGraphs has him rated as the 13th-best defensive outfielder in baseball. I was hoping for some sort of progression with Kepler's bat. Bad luck and that low BABIP seems to follow him around since 2016. There will come a time where it's not just bad luck, and this is who he is. The defensive value he's seeing this year will be siphoned away by Buxton next season... The stick needs to get better. Kiriloff is knocking on the door. Insanity. Odorizzi can't make it through the order the 3rd time, so just keep making him do it, and expect different results. I mean Molly did pull him before he gave up any damage. He got Lindor, he got Brantley, what were you gonna do? Yank him right after the Ramirez walk? At this point there is little to lose from seeing if Odorizzi can get through a lineup a third time. He did it once this year, in the start just prior to todays. But those issues should definitely be part of the equation regarding how he figures into plans for 2019. Concur with Gleeman. Nothing to lose by experimenting on an Odorizzi start. All true. The point isn't to win games, now, right? Just let him try. In Odorizzi's defense, the 3rd pitch to Rameriz was a perfect edge of the zone strike called a ball by inadequate eyes, and the 1st pitch to Encarnacion was a perfect low corner strike, also miscalled. The calls never really even out, they just keep magnifying different results. He pulled him before the damage?The two consecutive walks weren't damage? More to the issue...What's the point in sending him out for the 6th? To save the bullpen? He used it anyway, predictably. It's not just Odorizzi. Molitor has a prolonged history of waiting until the starter loses a lead before removing him. I find that incredibly maddening, and it's not just today. I realize this season is lost, but he does this when it matters. So you would have just pulled Odorizzi after the fifth inning in which he set down the side in order on 10 pitches, finishing things off with a swinging strikeout on Lindor? Also, what was his pitch count entering the 6th? 80 ish pitches? Absolutely. He struggled through the 4th, he struggles 3rd time through the order. Except that in his last start he didn’t. He retired all 7 A’s he faced third time around. Rather easily. In a lost season, was it really so ridiculous to see if maybe, just maybe, he is improving in that area? Especially when said player is under team control for the next season and as such needs to be evaluated to determine what his role will be. Well, we also need to evaluate the reliever, and the manager. Those were the first outs Odorizzi recorded past the 6th inning this year, IIRC. He’s not improving. He struggles third time, this is factual and incontrovertible. And this is about Molitor, in any case, and his dogged determination to squeeze more from his starter than is smart, or even helpful, since he routinely ends up using his bullpen in the inning in question anyway. As he did today. Only it’s with trouble abrew, or a lead gone, or a winnable game made not winnable. I think that is some of it.I think it is more pressure and nerves and adrenaline and some wrong thinking involved. I don't think a .320 hitter in the minors becomes a .230 batter in the majors (Buxton) because of the better pitching. The change is in the batter himself. Yes, the pitching is better but its not 90 BA points better. Likewise with pitching.I haven't seen Buesenitz pitch that much but I saw it in May and Berrios when they first came up. They didn't become 6 ERA pitchers in the majors because they were facing better hitters. It was because they weren't throwing the same way. They would throw a strike or two and then overthrow breaking balls that were truly waste pitches since they didn't even tempt the batter and now ahead in the count becomes behind in the count.Yes, major league batters are better but I am guessing the minor league batters were chasing breaking balls much closer to the zone. Its more Buesenitz changing than level of competition changing.How often do you hear "trust your stuff"? Chief is absolutely correct. You know what else is factual and incontrovertible? Byron Buxton can’t hit major league pitching. Clearly, we should leave him in AAA until his options are exhausted, and then some team can take him in the rule v draft, if there is a team out there foolish enough to ignore the factual and incontrovertible evidence. Odorizzi needs 1) a nutritionist, 2) an exercise coach and 3) a sports psychologist. If he believes he always has trouble after two times through the lineup, then he most certainly will. Odorizzi this year faces on average 22.1 batters per start. Yesterday he faced, what do you know, 22 batters. What I'm hearing here is he should only face 18 batters no matter the circumstance. Wouldn't be Rule 5. Waiver claim after an attempt to designate and assign outright. Maybe he shouldn't. Or maybe he should never, or rarely, start the 6th inning. He struggles the third time through the order. A team supposedly embracing analytics might notice things like this. A good manager wouldn't even need analytics to notice this. IMO the argument shouldn't be about Molitor keeping Odorizzi in the game too long. The argument should be that Odorizzi isn't a starting pitcher. Well, maybe so but that's another argument. He is a starting pitcher, so he shouldn't be kept in the game too long. Though, if you're going to say that he is a starting pitcher, now is the time to let him figure out how to get through the middle innings. I don't really have an issue with that at this point in the season. Odorizzi is so frustrating. Remember what I keep saying about his usage? He hasn't change a bit and at some point, you have to realize that he is who he is. He is a 5-inning pitcher. His numbers confirm that.